In each major city around the world there are a limited number of artists in that city's art scene who can be best described as "firsts among equals," in the sense that their presence and influence goes beyond just being a painter or a sculptor, etc. to being a major part of that city's art tapestry. Such an artist for the Greater Washington, DC region is Robin Rose, and although I haven't seen the show yet (but I will), I am hearing some good things as well as surprise, from his current show at The American University Museum at the Katzen Arts Center. Titled Robin Rose: Cypher, the exhibition opens today, and there will be an artist's reception on April 23 from 6-9PM. The show will remain on view through May 17, 2009. 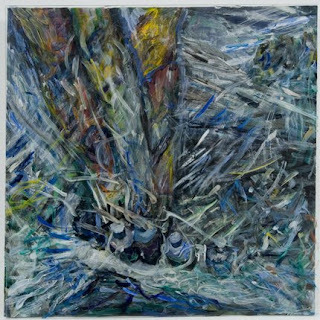 The show at AU is concurrent with Robin Rose: Endeavor at Hemphill Fine Arts, which represents the work of Robin Rose. The reason that his AU show is raising eyebrows from those who have seen it (someone described it to me as "out of the box!") is that what AU has on display (described as "aggressively altered found object assemblages") is so different and so very far from Rose's well-known and beautiful abstraction, that people are doing a double take. I am also told that a lot of it is just plain funny! I have never hidden my opinion that artists should always explore all facets and experiences and visual offerings of their artistry, rather than just deliver cookie-cutter art based on one concept. I love seeing a single Mondrian, but lose interest when I see a dozen of them all in one room. The way to see Robin Rose in the next few weeks is to visit his show at AU to discover this new side of this influential artist, and then drop by Hemphill Fine Arts to see what's new with his well-known encaustic on aluminum panel paintings. Wanna go to a Bethesda opening this Friday? Award winning artist Kristy Simmons opens her solo art show, Inklings to showcase her latest paintings exploring the intersection of the material world with virtual, or nonmaterial, reality. Thin glazes of underpainting are overlaid with thick brushstrokes, applied to both canvas as well as sheets of plexiglass on top of canvas – to give the audience the "inkling" of their combined and interdependent existence. Orchard Gallery located at 7917 Norfolk Avenue. The opening reception is April 10, 6 – 8:30pm, and is part of Bethesda's monthly "Arts Walk." Wanna go to an opening at UM tomorrow? The University of Maryland's Stamp Gallery has an opening of the first ever solo show by Ding Ren. Titled Here/There, the show is curated by Megan Rook-Koepsel and Jennifer Quick. Exhibition Dates: April 8 - May 6, 2009. Opening reception: Wednesday, April 8, 6-8pm (with performance by Ding's band, Bible Kiss Bible. Amazing musical videoworks! Let it play at leat a minute... you'll be hooked: Click here.